If you are working on a large plan, get the real coordinates [latitude, longitude] for two or more points and add them to the drawing. That way you can always work out the scale and dimensions. I know that drawings have scales, grids etc. on them and they are supposed to work. However, many times I've come across drawings where things don’t tie up. There can be hundreds of reasons – mix-ups as drawings are moved between different parties, human errors in CAD, messed units, printing problems, etc. Having just spent a few hours sorting out the latest wrongly scaled drawing that’s come across my desk, I thought it would be helpful to pass on this tip. Understanding: latitude are parallel lines running North and South of the equator. Longitude are vertical lines running West or East from the Greenwich prime meridian (located just outside London). 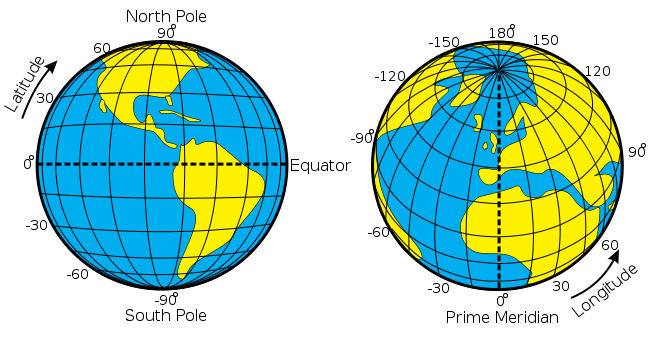 Distance between lines of latitude are approximately equal (minor variances due to the shape of the earth. Between lines of longitude the distance is greatest at equation and the lines converge at the poles. Presentation: latitude and longitude can be presented in degrees, minutes, seconds or decimal degrees. To mark coordinates using degrees, minutes, seconds - it is generally accepted that the latitude should be written first followed by longitude. The latitude degrees should be two digits and the longitude three digits (i.e. 08°14’16” 128°34’32”). Designations N, S, W or E are not required, although often used. Accuracy: when using on site plots, make sure you have sufficient accuracy in the coordinates (this will usually mean two or more decimal places on the seconds). One second of latitude is approximate equal to 30 M. One second of longitude is approximately equal to 30 M at the equation, moving to zero at the poles.